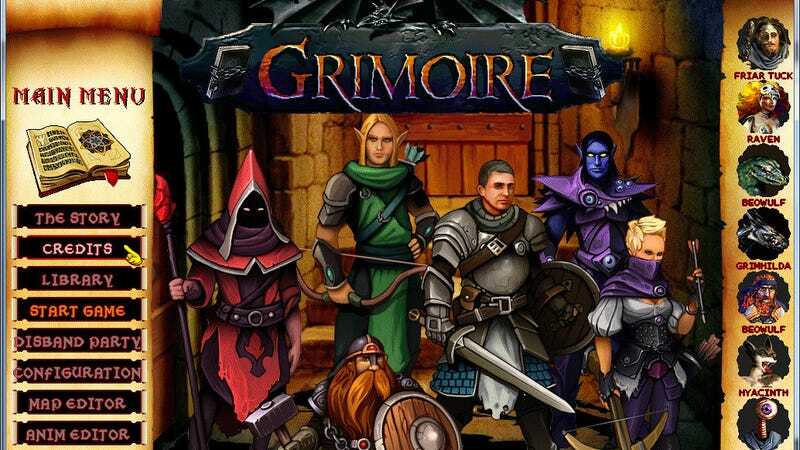 If you are wondering why Grimoire: Heralds of the Winged Exemplar, a new release on Steam, looks like something from the 90s, here is your answer: It is from the 90s. After a solid 20 years in development—or roughly twice as long as Final Fantasy XV—Grimoire is out today. The game crashes on launch, when it doesn’t crash on launch it crashes on any menu button being pressed, and when you actually get into the game it just doesn’t work, maybe in a few patches this game will be worth it but currently keep away. Still, Blakemore’s gone through quite a saga, promising during a string of crowdfunding campaigns in 2013 that he would release the game in May 2013, then delaying Grimoire several times including, most recently, last month. Even my delay powers aren’t that strong.